The Power BI for Office 365 cloud service works with Dynamics 365 for Customer Engagement apps to provide a self-service analytics solution. Power BI automatically refreshes the Dynamics 365 for Customer Engagement apps data displayed. With Power BI Desktop or Office Excel Power Query for authoring reports and Power BI for sharing dashboards and refreshing data from Dynamics 365 for Customer Engagement apps, sales, marketing, and service personnel in your organization have a powerful new way to work with Customer Engagement apps data. The Dynamics 365 for Customer Engagement apps content packs for Power BI cloud service allow you to easily access and analyze your sales, service, or marketing data. To create a Power BI dashboard using a content pack, follow these instructions. If you haven't already done so, register with Power BI. After you have signed in to Power BI, in the Datasets area click Get Data, under Services click Get, and then select from the following content packs. For the Sales Analytics and Service Analytics content packs, enter the URL of your Dynamics 365 for Customer Engagement instance, such as https://OrganizationName.crm.dynamics.com, where OrganizationName is the organization name of your instance of Dynamics 365 for Customer Engagement apps, and click Next. If your data center is outside of North America the crm.dynamics.com domain name may be different, such as crm2.dynamics.com, crm3.dynamics.com, crm4.dynamics.com, etc. To find the domain name, in the Customer Engagement apps web app go to Settings > Customizations > Developer Resources. The URLs listed will indicate the correct domain name. Under Authentication method, select oAuth2. Your Dynamics 365 for Customer Engagement apps organization data is imported and several visualizations become available. If the content pack you select does not open in your web browser, in the left pane of your Power BI workspace click the content pack under Dashboards. Content packs available for download. The Dynamics 365 for Customer Engagement apps content packs support the default out-of-box entities. However, you can customize the following content packs by downloading the .PBIX file and then using Power BI Desktop to customize the content pack before uploading it to the Power BI service. The Power BI Report Template for Connected Field Service for Dynamics 365 enables users to publish a Power BI report that displays the live heart beat of connected devices. For information about how to customize the content packs, see Customize Dynamics 365 for Customer Engagement apps Power BI content packs. Before users can embed Power BI visualizations on personal dashboards, the organization-wide setting must be enabled. This feature was first introduced in CRM Online 2016 Update 1. By default, Power BI visualization embedding is disabled and must be enabled before users can embed them in personal dashboards. Sign-in to Dynamics 365 for Customer Engagement apps as a user with the system administrator security role. On the Reporting tab in the Allow Power BI visualization embedding option, select Yes to enable or No to disable. To learn more about how to add Power BI tiles to personal dashboards in Dynamics 365 for Customer Engagement apps, see Embed Power BI tiles on your personal dashboard . To learn more about how to add Power BI dashboards to personal dashboards in Dynamics 365 for Customer Engagement apps, see Add a Power BI dashboard on your personal dashboard. You can connect to Dynamics 365 for Customer Engagement apps with Power BI Desktop to create custom Customer Engagement apps reports and dashboards for use with the Power BI service. From the Home tab, click Get Data, and then click More. In the Get Data list, select Dynamics 365 Online. Enter the Customer Engagement apps OData endpoint URL. It should look similar to this URL, where OrganizationName is the name of your Customer Engagement apps organization, and v8.1 is the version. Click OK.
For more information about the different endpoint versions, see Web API URL and versions. You can find your OData endpoint URL in the Dynamics 365 for Customer Engagement apps web client. Go to Settings > Customizations > Developer Resources and locate the URL under Instance Web API. In the Access an OData feed dialog click Organizational account, and then click Connect. If you aren't signed in to your Dynamics 365 for Customer Engagement instance, click Sign-in on the Access OData feed dialog before you click Connect. 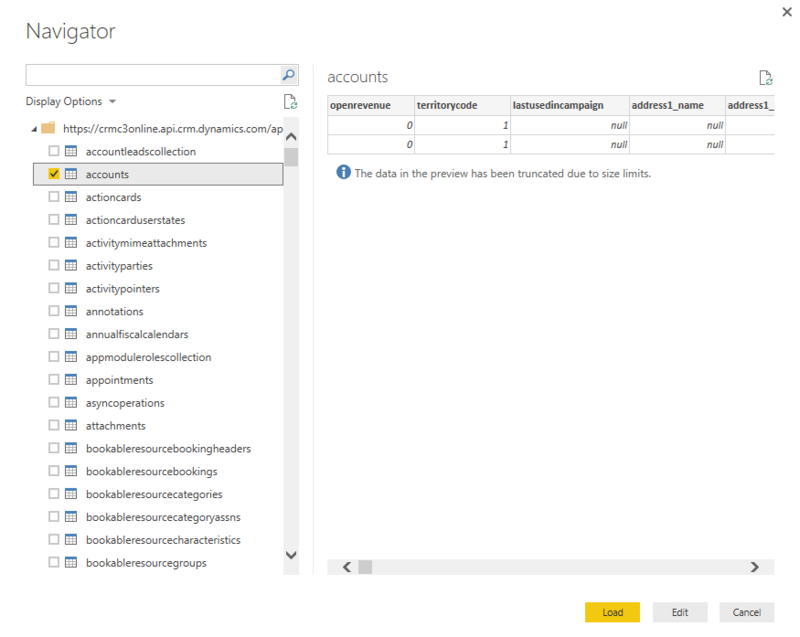 The organization database entity tables appear in the Power BI Desktop Navigator window. You can select both default and custom entities. For more information about creating reports with Power BI Desktop, see Power BI Support: Report View in Power BI Desktop. You can use similar steps to connect to Dynamics 365 for Customer Engagement apps using Office Excel Power Query by selecting From Other Sources on the Power Query tab in Excel.